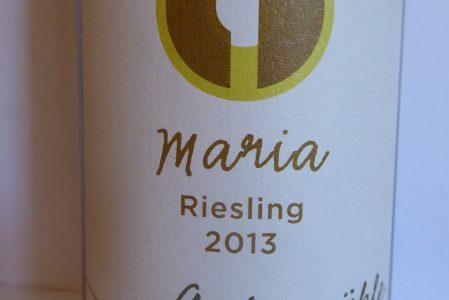 The Riesling Maria 2013 is white wine produced by the Ankermühle winery located in the Rheingau region of Germany, a little bit West of Wiesbaden. 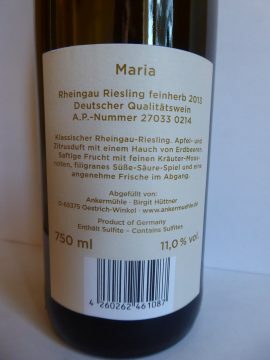 This feinherb Riesling has a nice golden color and a rich nose that offers perfume of vanilla and almonds. It is both crisp, fresh and generous in the mouth with its yellow fruits aromas (mirabelle plums) associates to hints of lemon in the background. 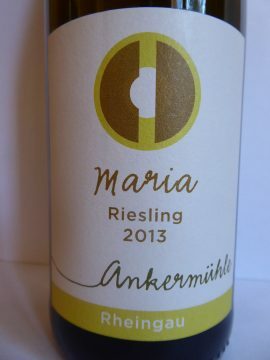 It is to be noticed that even if it was closed by a screw cap, this Riesling Maria 2013 of the Ankermühle winery cultivated on the shore of the Rhine has aged gracefully without loosing it freshness and aromatic qualities.